You may spend resources from Elrond's resource pool to pay for Spirit, Leadership, and Tactics allies. Response: After a character is healed by another card effect, heal 1 damage on it. Each enemy in play gets +1 engagement cost for each Hobbit hero you control. Response: After you engage an enemy with an engagement cost higher than your threat, draw a card. 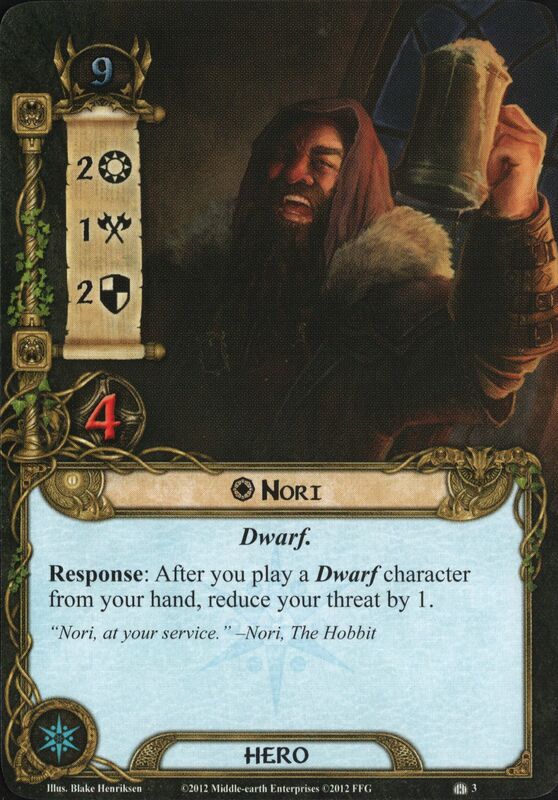 Gimli gets +1 Attack for each damage token on him. 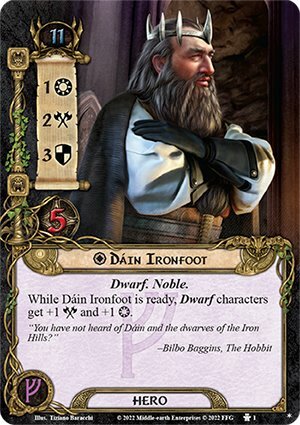 While Dain Ironfoot is ready, Dwarf characters get +1 Attack and +1 Willpower. 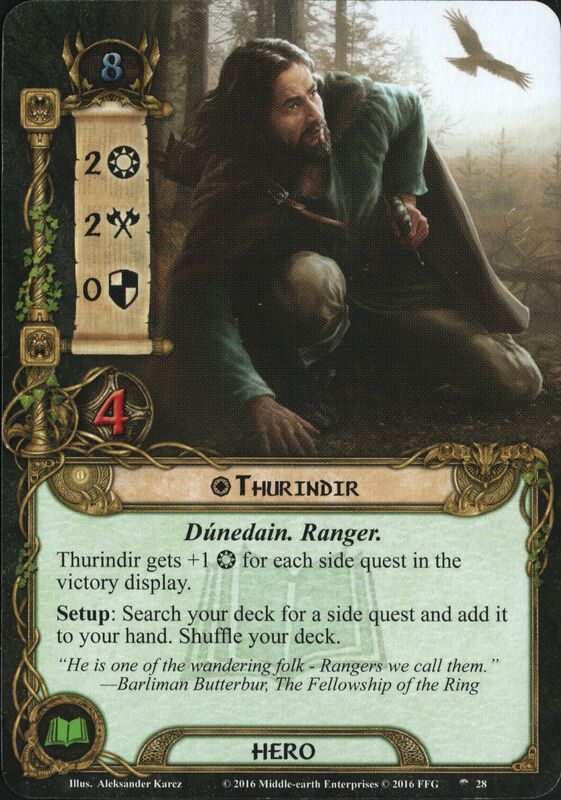 While Thalin is committed to a quest, deal 1 damage to each enemy as it is revealed by the encounter deck. Action: Exhaust Denethor to look at the top card of the encounter deck. You may move that card to the bottom of the deck. Lower the cost to play Weapon and Armor attachments on Beregond by 2. Action: Exhaust Warden of Healing to heal 1 damage on up to 2 different characters. Then, you may pay 2 Lore resources to ready Warden of Healing. Action: Exhaust Faramir to choose a player. Each character controlled by that player gets +1 Willpower until the end of the phase. Response: After Envoy of Pelargir enters play, add 1 resource to a Gondor or Noble hero's resource pool. 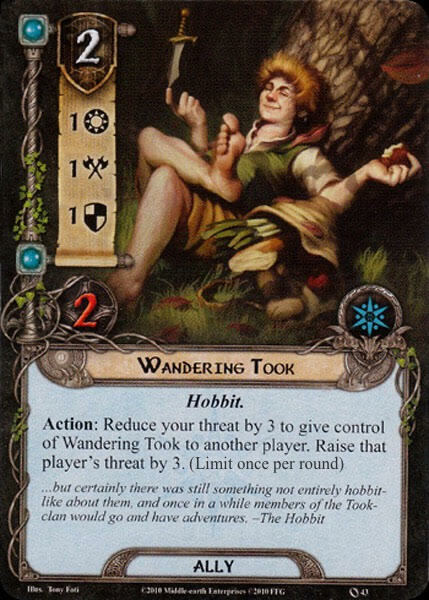 Response: After you play Erebor Hammersmith, return the topmost attachment in any player's discard pile to his hand. Action: Exhaust Master of the Forge to search the top 5 cards of your deck for any 1 attachment and add it to your hand. Shuffle the other cards back into your deck. Vassal of the Windlord cannot have restricted attachments.Forced: After an attack in which Vassal of the Windlord attacked resolves, discard Vassal of the Windlord from play. Response: After Miner of the Iron Hills enters play, choose and discard 1 Condition attachment from play. Cannot have restricted attachments. Treebeard enters play exhausted and collects 1 resource each resource phase. These resources can be used to pay for Ent cards played from your hand. Action: Pay 2 resources from Treebeard's pool to ready an Ent character. Action: Exhaust Daughter of the Nimrodel to heal up to 2 damage on any 1 hero. Response: Exhaust Honour Guard to cancel 1 point of damage just dealt to a character. Valour Response: Exhaust and discard Honour Guard to cancel up to 5 damage just dealt to a character. Cannot have restricted attachments. Enters play exhausted. Response: After Quickbeam enters play, deal 1 damage to him to ready him. Cannot have restricted attachments. Enters play exhausted. Response: After Wellinghall Preserver readies, heal 1 damage from an Ent character. Cannot have restricted attachments. Enters play exhausted. Eagles of the Misty Mountains cannot have restricted attachments. Eagles of the Misty Mountains gets +1 Attack and +1 Defense for each facedown attachment it has. Response: After another Eagle character leaves play, you may attach that card facedown to Eagles of the Misty Mountains. Erebor Record Keeper cannot attack or defend. Action: Exhaust Erebor Record Keeper and pay 1 Lore resource to choose and ready a Dwarf character. Forced: After Dúnedain Hunter enters play, search the top 5 cards of the encounter deck for a non-unique enemy and put it into play engaged with you. If no enemy enters play by this effect, discard Dúnedain Hunter. Shuffle the encounter deck. Action: Exhaust Gildor Inglorion to look at the top 3 cards of your deck. Switch one of those cards with a card from your hand. Then, return the 3 cards to the top of your deck, in any order. At the end of the round, discard Galadriel from play. 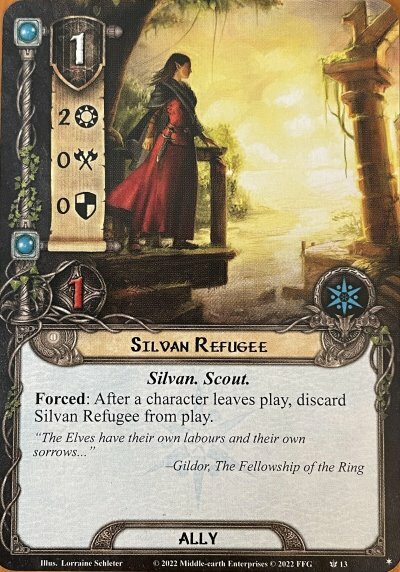 Response: After you play Galadriel from your hand, search the top 5 cards of your deck for an attachment of cost 3 or less and put it into play. Put the remaining cards back in any order. Each Outlands character you control gets +1 Attack. Response: After Marksman of Lórien enters play, choose an enemy. That enemy gets -2 Defense until the end of the round. Each Outlands character you control gets +1 hit point. Action: Discard Westfold Outrider to choose an enemy not engaged with you. Engage the chosen enemy. Action: Raise your threat by 1 to ready Boromir. (Limit once per phase.) 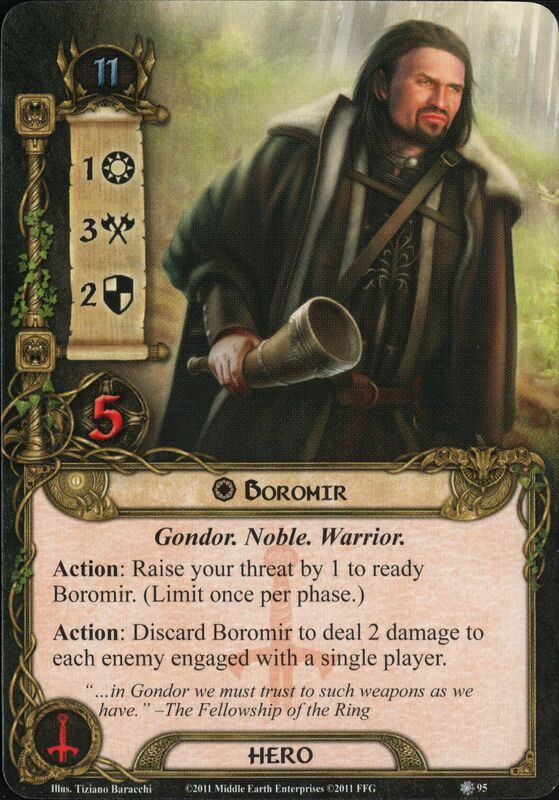 Action: Discard Boromir to deal 2 damage to each enemy engaged with a single player. Merry gets +1 Attack for each Hobbit hero you control. Response: After Merry participates in an attack that destroys an enemy, ready another character that participated in that attack. Each enemy engaged with you gets -1 Defense. Response: After Aragorn participates in an attack that destroys an enemy, choose an enemy not engaged with you and engage that enemy. Response: After Glóin suffers damage, add 1 resource to his resource pool for each point of damage he just suffered. Thurindir gets +1 Willpower for each side quest in the victory display. Setup: Search your deck for a side quest and add it to your hand. Shuffle your deck. Cannot have restricted attachments. Enters play exhausted. Booming Ent gets +1 Attack for each damaged Ent character you control. Cannot have attachments. Lower the cost to play Bill the Pony by 2 if you control Sam Gamgee. Each Hobbit character gets +1 hit point. Response: After Galadhrim Minstrel enters play, search the top five cards of your deck for an event card and add it to your hand. Shuffle the other cards back into your deck. Response: After you engage an enemy, if you control at least 1 Dúnedain hero, spend 1 resource to put Ranger of Cardolan into play from your hand, under your control. At the end of the round, if Ranger of Cardolan is still in play, shuffle it into its owner's deck. Cannot attack or defend. Action: Spend 1 Lore resource and exhaust Ioreth. Then, heal 3 points of damage on a character. Any player may trigger this action. Descendant of Thorondor cannot have restricted attachments. Response: After Descendant of Thorondor enters or leaves play, deal 2 damage to any 1 enemy in the staging area. 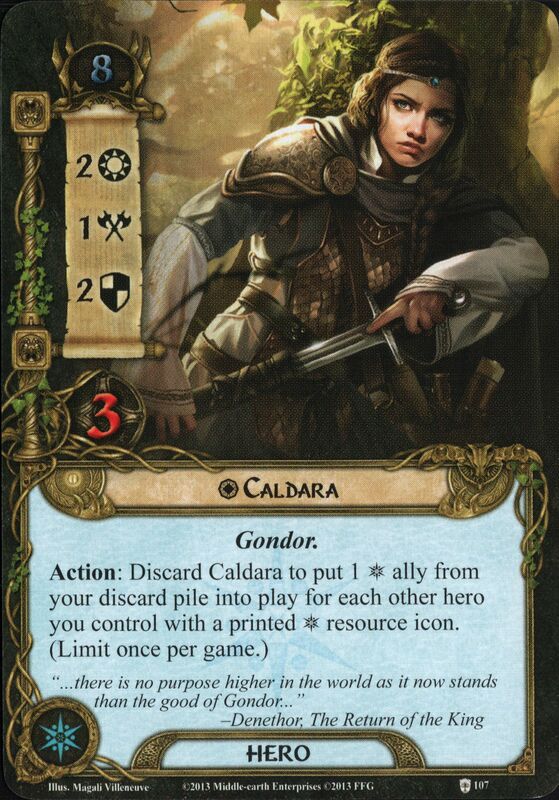 Response: After Squire of the Citadel leaves play, add 1 resource to a Gondor hero's resource pool. 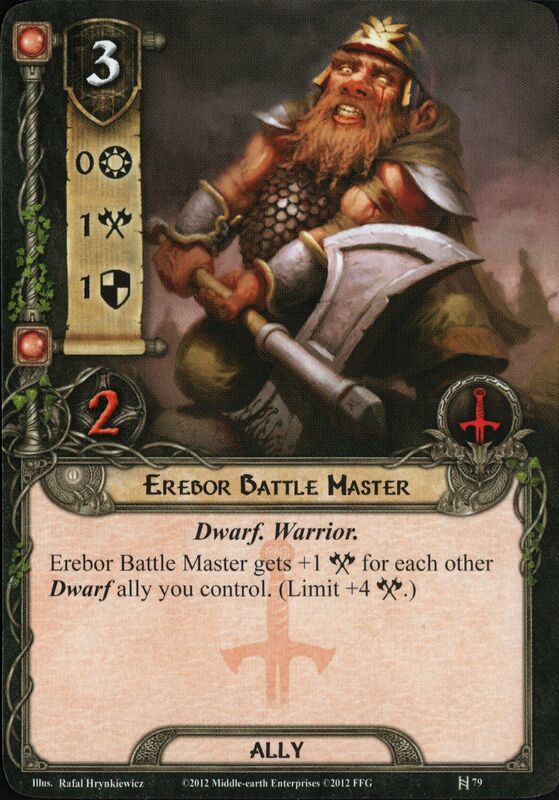 Erebor Battle Master gets +1 Attack for each other Dwarf ally you control. Response: After a Silvan ally enters play, that ally gets +1 Willpower, +1 Attack and +1 Defense until the end of the round. 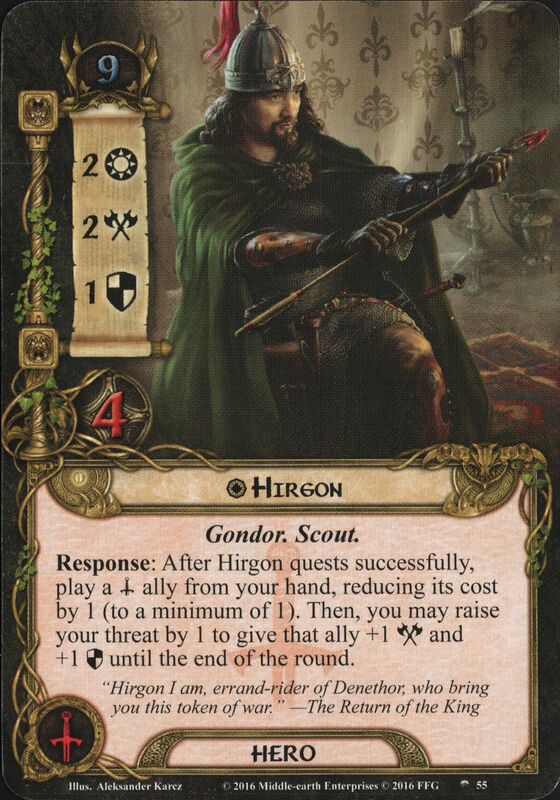 While Boromir has at least 1 resource in his resource pool, Gondor allies get +1 Attack. Response: After Hirgon quests successfully, play a Tactics ally from your hand, reducing its cost by 1 (to a minimum of 1). Then, you may raise your threat by 1 to give that ally +1 Attack and +1 Defense until the end of the round. Each hero with a printed Tactics resource icon gets +1 Willpower. While Elrohir is in play, Elladan gets +2 Attack. Response: After Elladan is declared as an attacker, pay 1 resource from his resource pool to ready him. You may use resources from Hirluin the Fair's resource pool to pay for Outlands ally cards of any sphere. While Elladan is in play, Elrohir gets +2 Defense. Response: After Elrohir is declared as a defender, pay 1 resource from his resource pool to ready him. Each Spirit hero with an attached Mount gets +1 Willpower. Each Tactics hero with an attached Mount gets +1 Attack. Each Leadership hero with an attached Mount gets +1 Defense. Each hero you control with a printed Lore resource icon gets -1 threat cost. Boromir gets +2 Defense while defending against an enemy with an engagement cost higher than your threat. Response: After Boromir takes any amount of damage, ready him. Response: After Son of Arnor enters play, choose an enemy card in the staging area or currently engaged with another player. Engage that enemy. Response: After a Silvan character readies during the refresh phase, heal 1 damage from that character. Response: After Ered Luin Miner is discarded from the top of your deck, put it into play under your control. Knight of the White Tower's resource cost must be paid from a single hero’s resource pool. At the end of the round, discard Elrond from play. Response: After Elrond enters play, choose one: heal all damage on a hero, discard a Condition attachment, or each player draws 1 card. 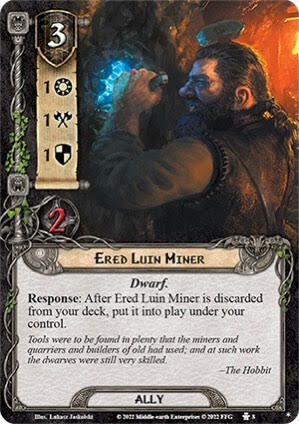 Forced: At the end of the round, discard Dwarven Sellsword unless the players as a group spend 1 Leadership resource. Response: After you play Hunter of Lamedon from your hand, reveal the top card of your deck. If it is an Outlands card, add it to your hand. Otherwise, discard it. Action: Exhaust Ithilien Tracker to lower the Threat of the next enemy added to the staging area to 0 until the end of the phase. If the active location shares a Trait with a location in the victory display, Rossiel gets +2 Willpower. If the attacking enemy shares a Trait with an enemy in the victory display, Rossiel gets +2 Defense. Radagast collects 1 resource each resource phase. These resources can be used to pay for Creature cards played from your hand. Action: Spend X resources from Radagast's pool to heal X wounds on any 1 Creature. Guardian of Arnor gets +1 Defense for each enemy engaged with you. While Mirkwood Runner is attacking alone, the defending enemy does not count its Defense. If each hero you control belongs to the same sphere of influence, you may assign damage from undefended enemy attacks to White Tower Watchman instead of a hero you control. Response: While Déorwine is defending, spend 1 Leadership resource to cancel a shadow effect dealt to the attacking enemy. Any player may trigger this action. Veteran of Osgiliath gets +1 Willpower, +1 Attack, and +1 Defense while your threat is 40 or higher. X is the Threat of the active location. Travel Action: Discard Ghân-buri-Ghân to travel to a location without resolving its Travel effect. Fornost Bowman gets +1 Attack for each enemy engaged with you.